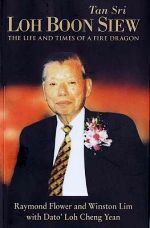 This is a true story of a poor boy from a village in south China who not only made it rich in Penang, but also became a well-known philanthropist – Tan Sri Loh Boon Siew. I like the way the story is brought across, it is quite touching in some parts of the story. In his early days, when the family moved from China to Malaysia – Penang, Boon Siew could have join his father and be a rickshaw puller and take back home as much as 70 or 80 cents a day. Instead, he choose to apprentice himself to a mechanic with no pay, until he learnt some basic skills. Boon Siew feels that learning a trade provide better long-term prospects of advancement. As Boon Siew is illiterate, he spoke nothing but native Fujianese dialect. This make it difficult for him to learn the names of the tools and different parts of the engine in English. To avoid the malicious comments directed at him in the workers’ quarters, Boon Siew began sleeping on the buses parked at the old Maxwell Road depot near where he worked. As Boon Siew was not chased away from the buses where he spent his nights, he sought some means of showing his gratitude by sweeping and washing the buses when they had stopped running for the day. The bus-owners later began paying him 10 cents per bus every day. Moral 1 of the story : Master a trade well to have better prospects in future. Moral 2 of the story : Be grateful to even the small kindness shown to you. Boon Siew washed three or four buses every night, his meagre earnings (together with the remnants of his wage) going straight into a battered Ovaltine tin that Madam Saw Kit kept under her bed. By the time he reached the age of 18, Boon Siew had become a car gearbox specialist in his own right. He was known for his mechanical skills and handled vehicles from local and international firms. Boon Siew was earning a higher wage than any of his peers. Unlike other young men of the time who gambled, smoked opium or patronised ladies of the evening, Boon Siew remained careful with his money. Moral 3 of the story : Save for a rainy day and do not get involved in vices. Boon Siew was modest in his tastes and practices within the privacy of his own home. The Chinese press dubbed Boon Siew “King of Motorbikes” but he was more generally known as “Mr Honda” in Malaysia and Singapore, as he was the first sole distributor of Honda motorcycles in Malaysia. He acquired shares in his friends’ companies to help them out when they were in difficulty. Tan Sri Loh nevre believed that “big fish must eat small fish” in business. He often took the trouble to aid them in other ways too. Buying properties was part of his risk management strategy, especially after the 1986 economic crisis. He wanted to build up the asset base and sustain continuity of cash flow since the felt that it was important to reduce borrowing. Oriental Holdings’ companies operate in a variety of areas from spare parts to plantations and plastics. Surely the Tan Sri couldn’t have known all about the different fields that fell under the purview of his company? You’d be surprised at how much he picked up over the years. Even matters related to law were part of his general knowledge. His lawyers were among the best – he always got the best advisors he could – and een they were amazed at what he knew about the legal profession, sometimes. Was Boon Siew well regarded by his employees? I think it was the fact that he care for us as people. WHen a young part-time worker was injured by a falling brick during the renovation of the City Bayview Hotel, Penang, Tan Sri Loh had the badly bleeding boy put into his car, sped him to hospital and did every thing he could to facilitate the young man’s recovery, including arranging for a specialist to operate on him and covering the expenses. Tan Sri Loh told the doctor that he would guarantee payment for whatever was needed. All that even before the boy’s parents arrived. And he never mentioned a word about the blood over the interior of his car. In his later years, family and good friends were most important to him, not his business, not money or social status. He was always reminding us that in life one must be charitable and help those who are less fortunate, and that is why we set up a benevolence fund in his name to help fund education for students. My father knew that one day he would have to leave this world and he reminded me many times that I must carry on the business as best as I can for the sake of future generations. He also wanted me to set up his home as a museum to preserve and exhibit his legacy to the country he loved. The proceeds from visitors to the Loh Boon Siew Museum will fittingly go to charity, in memory of my dearly beloved father, the Fire Dragon, a simple, unassuming personality who never took his fortune for granted and was, above everything else, a friend to all. Interesting post, it really makes me think. I always like to read interesting posts about things like this. Keep the good articles coming. Thanks again for sharing it with us. hi there and thanks for your information : I have undoubtedly discovered new stuff from your site. I however came across a few techie issues browsing this site. I was wondering whether your hosting is okay? Not that I am complaining, but sluggish loading instances times will very likely impact your placement bing and may ruin your high-quality information here. Well I’m adding this Feed to my personal reader and can look for much more of your fascinating posts.. I wish to express my appreciation to the writer for rescuing me from such a setting. After researching through the internet and obtaining tricks which were not helpful, I believed my entire life was done. Being alive without the answers to the difficulties you have solved through this website is a serious case, and the ones which might have badly affected my entire career if I had not come across your web page. Your expertise and kindness in controlling all the pieces was tremendous. I am not sure what I would’ve done if I hadn’t come upon such a stuff like this. It’s possible to at this moment look ahead to my future. Thanks for your time very much for the professional and results-oriented guide. I will not hesitate to recommend the sites to anybody who would need assistance about this problem. hello,. I was informed by one of my roomates to support your website. I like the design of the blog very much. The article is very amazing. Please keep on the good work. I absolutely will check out it frequently and introduce it to my classmates. There’s noticeably a bundle to learn about this. I assume you made certain good points in features also.You made some first rate points there. I looked on the internet for the issue and found most individuals will go together with together with your website. Extremely good article. If there were more writers like you I’d have more websites to visit when I do go online. Hahaha.